Nightmare For Young Mom Begs The Question, Could It Happen To Us? Waiting and waiting, sometimes for hours, at a government office like DMV or Social Services – often with a small child who is getting tired and frustrated. But perhaps no experience we’ve ever had in this situation can compare to the horrific scenario that unfolded for a mom in New Jersey. Jazmine Headley had been waiting for nearly four hours at her local Department of Social Services office while trying to renew vouchers for her son’s daycare. We can all relate to how crowded and uncomfortable these offices can be and due to a lack of available chairs, Jazmine sat on the floor with her 18-month-old son cradled in her lap. That’s when a choice we might all make in the same situation turned into a nightmare. A security guard at the office approached Jazmine and told her that she could not sit on the floor in the interest of blocking others walking through the office. But standing for nearly four hours with a toddler in your arms can be exhausting, and Jazmine refused to stand when the security guard told her she must do so. When Jazmine said she would not stand that long with her son, the situation escalated in the worst possible way. Police were called, and the young mother ended up face-down on the floor as authorities struggled with her to rip her young child from her arms. At one point, a female officer pointed a stun gun at the crowd who was responding in anger to the treatment of Jazmine and her baby. Police responded by saying the security guard was the first to pull Jazmine to the floor, but regardless, the young mother ended up in a violent struggle with police. She was arrested and taken to Rikers Island jail, and her young son was taken away by NYPD officers. He was later released into the custody of his grandmother. Amid public outrage, including from New York City Mayor Bill de Blasio, prosecutors from the District Attorney’s office decided to drop the charges, which included a litany of ridiculous offenses — obstructing governmental administration, resisting arrest, endangering the welfare of a child, and trespassing. But it appears that Brooklyn District Attorney Eric Gonzales already viewed the footage and had spoken to Mayor de Blasio following the incident. His statement read, in part: “This young and desperate mother has already suffered as a result of this arrest far outweigh any conduct that may have led to it: she and her baby have been traumatized,” according to CBS News. 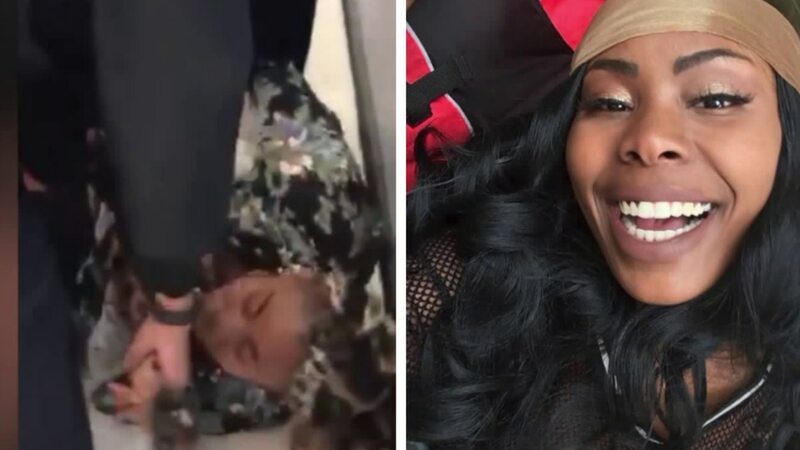 Jazmine Headley would have been immediately released from jail the same day, but in a twist to the story, she was held on an unrelated warrant for credit card fraud in New Jersey. After being ordered to pay a $1,000 fine and perform community service, she was finally released three days after her arrest and reunited with her son. No matter the circumstances, no mother and child deserved to be ripped apart – humiliated and traumatized – in a public place. Human Resources staffers involved in the incident have been placed on modified duty until the investigation is completed, and administration has apologized for the incident. Jazmine and her family are currently considering filing a civil suit against everyone involved in the traumatic incident. For now, mother and child are safe, but the story could have ended in tragedy if this mom or her small child were injured. It is a reminder of just how quickly anger and frustration can escalate into a dangerous situation, and that a calm response and a little compassion for this tired mom could have led to a different ending. What do you think of the way authorities reacted in this situation? Leave us your comments.